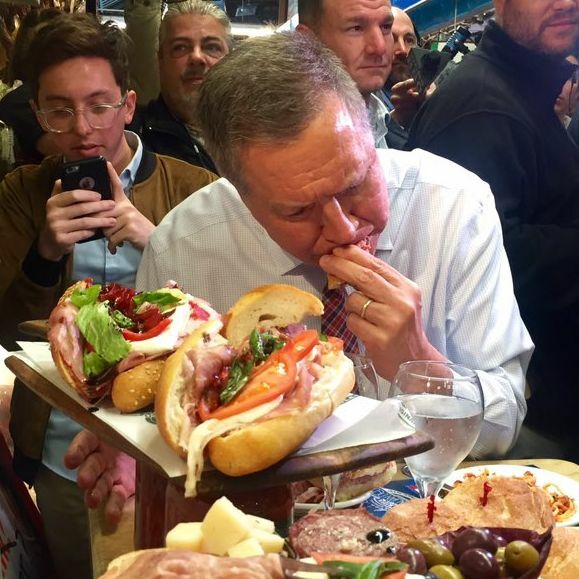 As you may recall, presidential candidate — and new strategic pal of Ted Cruz — John Kasich hit Mike’s Deli in the Bronx for a campaign stop earlier this month, where the Ohio governor set about inhaling the spread of Italian-American food set before him. It was terrifying, it was hardly the only time Kasich’s been caught eating in an untoward fashion, and plenty of people took notice. One of those people, of course, was fellow Republican candidate Donald Trump. And today, while in Rhode Island, Trump let his fans know how he feels about Kasich, saying, “I have never seen a human being eat in such a disgusting fashion.” He then went on to add that neither he, nor any of the Trump children, would ever be caught stuffing their maw with an Italian sub, claiming he always teaches his kids to eat small bites.